Cushion Reviews - Will It Help You Get Your Money Back? Cushion is a financial tool that scans your bank accounts and credit cards, identifies fees and interest charges and then negotiates with your banks to remove the charges. Cushion is one of several different apps that negotiate on your behalf to save you money. What makes this particular service unique is that it negotiates with banks via artificial intelligence to lower or eliminate fees and interest charges, whereas competing services tend to negotiate bills from cable companies. The company’s CEO is Paul Kesserwani, whose background is tech-heavy. Kesserwani worked at Twitter and three different tech security companies before founding Cushion late in 2016 and launching the service’s beta version in January 2018. He said the idea to create Cushion came after several fee-related experiences with banks. For example, he learned that his father did an international wire transfer and was charged fees from three different banks. Kesserwani looked back through his own bank and credit card statements and found more than $400 fees. He decided it was time to take action and create something that could help consumers deal with fees and other charges. According to Kesserwani, U.S. banks earn around $200 billion in credit card interest charges and fees each year. Will Cushion work on your behalf to earn back some of the money the bank has charged your credit card, checking account or savings account? How exactly does it save you money? These are the questions we’re going to answer in this review via information we gathered from the Cushion website as well as an interview with Kesserwani. Editor’s note: Cushion is in its private beta phase. In order to get the service, you have to go to Cushion’s website and provide your email address. As we mentioned earlier, Cushion is designed to negotiate on your behalf to get full refunds or reductions of fees that banks have charged you. When you sign up for Cushion, you’ll have to provide banking account information through which the service can connect to your accounts. At that point, the behind-the-scenes technology goes to work. 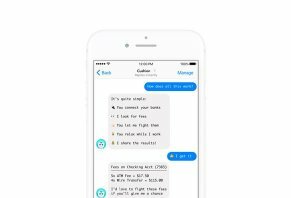 Cushion uses bot called “Fee Fighter” to scan your connected accounts to identify fees and interest charges. These accounts can include checking, savings and credit cards. When Fee Fighter identifies a charge, it runs some math on your history with the bank past refunds, and many other data points to determine the likelihood that it can successfully negotiate with your bank. At that point, Fee Fighter will tell you which fees it thinks it can reverse and then will ask your permission to negotiate on your behalf. You’ll know within 24 hours if you’ll get a refund. Banks allow customers electronic correspondence through one of two ways: email or chat. Sometimes they offer both. Cushion identifies which of the two ways your bank allows correspondence and then formulates emails or chat responses that negotiate for you based on your specific financial standing with the bank. In a general sense, he says, Fee Fighter is important because consumers don’t have advocates to work on their behalf to get bank fees refunded, even ones that were legitimate. For example, most of us see late fees for a credit card and accept them since we did, in fact, pay late. Now, it’s important to keep in mind that Cushion’s math decides which fees are more likely to be refunded than others; you don’t have a say outside of your decision to let Fee Fighter pursue fee reversals and reductions. One of the advantages of this automation is that the service’s algorithms rotate between accounts. So, instead of hammering away at multiple late fees and charges in one account, one after the other, it jumps from account to account to avoid banks saying no to you just because you recently earned a refund. Pro tip: Banks typically allow you to negotiate charges as old as between three and six months. To use the previous example, why would a bank want to refund your fees if those fees are legitimate? Kesserwani told us a lot of this has to do with loyalty and cost. In other words, it’s cheaper for the bank to refund a $37 late fee than it is for them to lose your business and have to bring a new customer on. Kesserwani told us that Cushion sends your banking information to a third-party security firm who specializes in encryption, data security and compliance. Because of this, your sensitive data is not at risk in the event that someone hacks Cushion because your sensitive information is not on their servers. He also pointed out that the company’s head of engineering, Ivan Balepin, is a security expert with 20 years of development experience. Prior to Cushion, Balepin was at Bill.com, where his modifications to existing code made it possible for the site to process more than $40 billion in transactions per year. In addition to this, Kesserwani pointed out, several of the company’s investors are security experts at LifeLock and Symantec. What makes this service unique is that it’s the only one we’ve reviewed that uses artificial intelligence to negotiate on your behalf for the reversal or reduction of bank fees and finance charges. However, this isn’t the only app out there that uses bots to try and save you money. Normally, we’d compare Cushion to other similar services to help you decide which one is best. But, because the service doesn’t have a direct competitor, we’ll provide some insight into other apps that offer to save you money on things like subscriptions and bills. Trim is an app that tracks your spending and provides you AI negotiation of bills from cable/mobile companies. In our review of Trim, we point out that they provide bill-negotiation services for all the major telecom companies in the U.S., including T-Mobile, Comcast, AT&T, Sprint and Google Fiber. If the company is able to save you money on a monthly bill, they take a 25% cut of whatever it is that you save the first year. HighYa reviewers give the service low scores, with one customer saying that Trim negotiated the customer out of an excellent cell phone plan into one that wasn’t as good and cost more money. We believe that Cushion offers an advantage because it’s not making changes to your accounts. Rather, it’s asking for refunds using data the Fee Fighter gathers. Because of this, you never have to worry about it modifying the terms of, for example, your phone or internet plan. Clarity Money and Hiatus are two apps that, among other things, will cancel subscriptions for you that you don’t often use. In the world of AI negotiation, these services are pretty paltry compared to Cushion not so much in terms of how much money they save but in the time they save. Canceling a Netflix subscription, for example, takes all of about one minute through their app. Other subscriptions that aren’t app-based may require a phone call and, even if you forgot your account information, you’re often able to verify who you are by providing your address and social security number. Negotiating with your bank over the phone or via chat, on the other hand, usually takes a lot longer than one or two minutes. If the initial person with whom you speak rejects your request, you might have to talk to a supervisor to try and get your fee or charge taken care of. And, if you don’t have the time or negotiation skills to haggle with bank reps, there’s a good chance you don’t want to spend the time doing it. Based on this, we believe that the service Cushion offers has more tangible value, both in time and money, than Clarity Money and Hiatus. In our opinion, we believe Cushion is a service that can provide a lot of benefit to consumers who have multiple bank accounts and tend to pay late and carry balances. Their AI negotiating saves you time and money and, at the time of publishing, the app is free. Based on our research, we believe the app’s greatest weakness is that it’s only in its beta phase. The number of users allowed to use the service is limited and, because of that, you can’t start using it right away. Also, for those who don’t use Facebook, the service probably isn’t a good fit because your messages and notifications run through Facebook Messenger. In general, though, we think that Cushion provides you with a unique, free service that most likely will be able to save you money on late fees, interest charges and other fees your bank puts on your account. I decided to try Fee Fighter, and 48 hours later I had the surprise of a lifetime! The bot was able to negotiate a reimbursement of 93 ATM charges because the bank agreed that there weren't enough ATM's in my area that would allow free withdrawal. My account was credited about $240. Unfortunately, Cushion isn't working with my personal bank (yet!). But my sister has one of the banks (Chase) they work with, so I told her she should download and see where it goes. She texted me a week or so after she downloaded and sent me screenshots of everything that the Cushion app had gotten refunded...nearly $500. Countless monthly service charges and OD fees were refunded to her account. Definitely would recommend! Hi Brit, thanks for sharing this story! So glad to hear we were able to help your sister, we can't wait to do some fee fighting for you too! I was skeptical at first when I saw that the website claims the bot has a black belt in fee negotiation. But I gave it a shot, and within minutes of signing up the bot was going after some ATM fees I didn't even realize were refundable. I ended up getting those reversed, and the bot is now chipping away at my interest charges. It was easy, quick, and best of all - I got some money back! Write a Review for Cushion!